There is a strong relationship between sleep and behavioral problems. These findings are often interpreted via environmental explanations, such that poor sleep directly exacerbates or causes symptoms of aggression and behavior problems. However, there are other possible explanations, such that the genes predicting poor sleep also predict aggression or rule-breaking. The current study sought to elucidate the origin of this relationship. The sample was composed of 1030 twin pairs (426 monozygotic and 604 dizygotic). The sample was 51.3% male with a mean age of 8.06 years (range 6–11.96; SD = 1.45). Aggression, rule-breaking and sleep were assessed through the Child Behavior Checklist (CBCL). We fitted bivariate Cholesky genetic models to the data, decomposing the variance within, and the covariance among, aggression, rule-breaking, and sleep functioning into their genetic and environmental components. Genetic correlations between all sleep variables and aggression were significant and moderate to large in magnitude, but mostly small and non-significant between sleep and rule-breaking. We did not find evidence of a causal or environmental relationship between the majority of sleep variables and aggression, but rather clear evidence of genetic pleiotropy. However, the pattern of associations between rule-breaking and sleep measures was less consistent. Aggression and rule-breaking appear to be differentially associated with sleep. This project was supported by R01-MH081813 from the National Institute of Mental Health (NIMH) and R01-HD066040 from the Eunice Kennedy Shriver National Institute for Child Health and Human Development (NICHD). The content is solely the responsibility of the authors and does not necessarily represent the official views of the NIMH, NICHD, or the National Institutes of Health. The primary author takes responsibility for the integrity of the data and the accuracy of the data analysis. The ideas and analyses presented in this manuscript were not disseminated prior to publication. The authors thank all participating twins and their families for making this work possible. JJMV is supported by pre-doctoral scholarship (19814/FPI/15) of the Fundación Séneca. Ethics approval was provided by the Michigan State University IRB. Parent(s) provided an informed consent for both their children and themselves. The twins provided informed assent. Brescianini, S., Volzone, A., Fagnani, C., Patriarca, V., Grimaldi, V., Lanni, R., ... Stazi, M. A. (2011). Genetic and environmental factors shape infant sleep patterns: A study of 18-month-old twins. Pediatrics, 127(5), e1296–1302. https://doi.org/10.1542/peds.2010-0858. Frick, P. J., Lahey, B. B., Loeber, R., Tannenbaum, L., Van Horn, Y., Christ, M. A. G., ... Hanson, K. (1993). 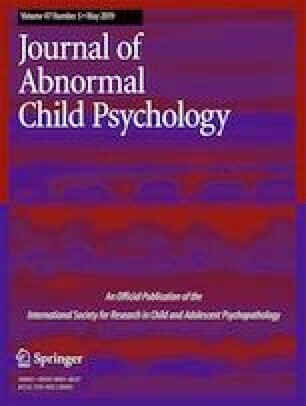 Oppositional defiant disorder and conduct disorder: A meta-analytic review of factor analyses and cross-validation in a clinic sample. Clinical Psychology Review, 13(4), 319–340. https://doi.org/10.1016/0272-7358(93)90016-F.
Porsch, R. M., Middeldorp, C. M., Cherny, S. S., Krapohl, E., van Beijsterveldt, C. E., Loukola, A., ... Bartels, M. (2016). Longitudinal heritability of childhood aggression. American Journal of Medical Genetics. Part B, Neuropsychiatric Genetics, 171(5), 697–707. https://doi.org/10.1002/ajmg.b.32420.